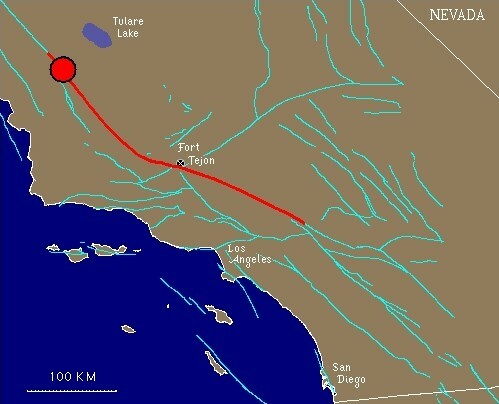 On January 9, 1857 a magnitutde 8.0 earthquake occurred on the San Andreas Fault in the Fort Tejon area. The fault ruptured 225 miles, which is located about 45 miles NE of San Luis Obispo, 75 miles NW of Bakersfield. The quake occurred about 8:20 AM. Due to the sparse population in the area and of California in general, the reported death toll from this massive quake was only 2 people. on January 13, 2010 at 1:06 am Comments Off on The Last Great One!